Kyrie Irving's departure from Cleveland - "They didn't want me there!" For many, the swap from the Cavaliers to the Celtics this past August was vexing. Irving was a champion on a contending franchise with a transcendent star, LeBron James. Who walks away from that? What they didn't know was Cleveland had explored trading Irving in June, long before he asked out, a fact conveniently omitted when word of his demand leaked. Irving made the decision to remain silent while the details of his request were, in his word, "distorted." "They didn't want me there," he says. "I had to show them I could play with them (high school teammates)," Irving says. "And, after a while, I had to show them I could dominate them." Irving was the point guard in name, but LeBron often assumed his role as a ball-dominant point-forward in crucial situations. It produced results. The team averaged 54 wins and went to three straight Finals in their three seasons together. But Irving's teammates say there were times Kyrie felt marginalized -- despite the fact that over the three years, he averaged nearly the same usage rate without LeBron (29 percent) as he did with him (28.6). Boston was not mentioned, but, league sources confirm, Gilbert later became keenly interested in securing the rights to Brooklyn's 2018 first-round pick, which the Celtics had acquired in the 2013 trade that sent Kevin Garnett and Paul Pierce to the Nets. When Gilbert, who declined to be interviewed for this story, was presented with the Celtics as a trade partner for Irving, he went to LeBron and tried to secure a pledge from his franchise player to remain beyond the 2017-18 season. James, team and league sources confirm, wouldn't commit. Nineteen months later, Irving is in Boston, and rumors are swirling that James could soon leave Cleveland, too. LeBron cornered the NBA notion that athletes should dictate their own destinies; Irving ripped that page out of James' book and implemented it accordingly. Celtics boss Danny Ainge, for his part, likens Irving to Larry Bird, who, depending on the situation, could be introverted or extroverted. Bird diverted attention if he felt too suffocated by the adulation, but he also embraced the limelight when the game was on the line and the ball was in his hands. "Those are threads Larry and Kyrie share," Ainge says. Bird was a bare-knuckles leader who didn't spare feelings. Irving, Ainge says, is still growing into his leadership role. 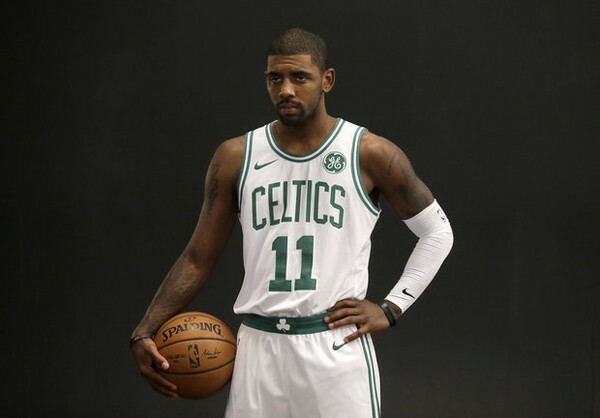 "When he got here, we talked about all the good things and not-so-good things Kyrie has done, who he wants to emulate, how he wants to be different than he was as a young player," Ainge says. "I'm happy," Irving insists. "I'm taking full advantage of this learning experience of being with this new group, this franchise. This is a long process, and I'm just happy to be part of it. "At times throughout your career, you take things for granted. I'm realizing as long as you take advantage of moments with great people you can learn from and then apply those to your life going forward, that's where fulfillment comes in." I encourage our CelticsLife readers to take in MacMullan's full ESPN article. She has always been a top-notch sports writer, and her article contains many interesting tidbits not covered here.